Note: The lightning bolt on the battery is only visible while charging. A LOT of other stuff.. check it out! Replay info: This theme works with Replay for 75c devices (250c devices work with Replay by default). BUT you need to have the International Edition of EScribe 2.0 SP15.1 or later. Your 75c needs to have the right firmware as well (at least 1.1 SP33.2 - that one works for me), once you update ESscribe and connect your device it should prompt you to update firmware. You also MUST enable Replay in your EScribe profile for it to work. Using replay: once the above has been completed, load this theme and switch to a replay-enabled profile. There should be a "NO REPLAY" button seen on the main screen. This means there aren't yet any puffs to save. So take a few puffs, until you find one you like. Then the button should change to "SAVE," and you can click that to save that latest puff. Once Saved, the button changes to "PLAYING" and you are in Replay mode. Click that if you want to end Replay. Replay Active (you can toggle this switch to save your last puff and activate Replay). You also cannot use a plain kanthal coil for Replay. You can use any temp sensing wire, including combinations (e.g. SS wrapped with kanthal). If anyone has suggestions, improvements, bugs, or anything else, please reach out in the comments below and/or leave a review. New update coming soon!! Thanks! Here are the available color options. Let me know if you have requests for others. Same changes for PLAINTEXT version. Changed settings for stats on main page. Now in the Display menu you can select to HIDE them (rather than select to SHOW them as it was previously). This is mainly so the screenshots are more accurate. If the stats are not displaying on the main page (current, voltage, resistance, battery percentage), check the settings in the Display menu. Forgot to include Preheat settings page in main menu. It's now added. 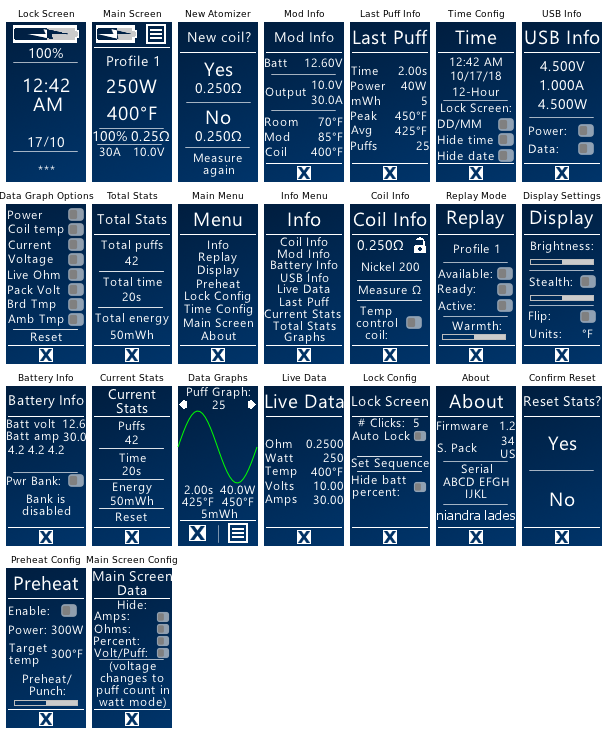 Mod info screen (renamed Live Info) now with more data: live ohms, live voltage, live current, live coil temp, etc. Could you please add a Pride Color Theme? @Levtos I would love to (and will try). The problem is all of the backgrounds need to be dark for the most part (because the text is white, so a block of yellow would be tricky for visibility). But I'll definitely give it a try. Glad you like the theme! Be sure to head over to the comments section if you have any more suggestions. Thanks! edit: just made it (check the downloads page), I had to darken the pride colors a bit, but I think it looks pretty good (and the text is visible). Let me know what you think! Great theme! Simple, yet complete. Excellent job! Looks ok, replay works but temp sensing on SS316 is non functional. I am aware that this is mainly due "Atomizer>TempSensingDetect" except in other themes it does detect? Thanks.. for anyone else reading, everything is working well as of the latest version. I use SS316 in TC mode and Replay mode (though I hear it's best to use "Watts" as material when using Replay). And I fixed the versioning thing in the About page (by removing it! I knew I wouldn't remember to always update it), so thanks for pointing that out! Easily my favorite theme. Very clean. stylish and easy to read. If you are looking for a theme that makes sense instead of being overly flashy for no good reason, this is the theme for you. Support from creator is exceptional. Thanks for the review, this was a few versions ago but I wanted to respond for anyone else reading. Replay is working (assuming you have the right firmware, etc, see above), and enabled it in your profile. On the Replay Settings page, the first two items (Replay Available and Replay Ready are read-only, meaning they just tell you if your device/coil/firmware is ready to do replay). Once both of those boxes are checked, you can click the third (Replay Active) to turn on Replay. That being said, it's all on the main screen which is a bit easier. Once in a Replay profile, there is a button that either says "NO REPLAY" (because there aren't any puffs to save), or "SAVE" (when it is ready to save a puff), or "PLAYING" (when Replay is active). And for the green, the battery used to turn green while charging. For some reason when Evolv generates screenshots, it doesn't let me decide which elements to show or hide. 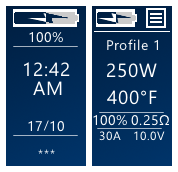 In the latest version, there is a lightning bolt in the battery to indicate it is charging, which again you can see in the screenshots, but it isn't visible during normal vaping. this is my favorite theme yet! the only issue is the puff stats won't reset. when i press "yes" nothing happens. This has been fixed thanks to @Ronbon172's help. There are now separate screens, "Total Stats" which can never be reset, or "Current Stats" which you can reset. This is how it is designed by Evolv, so Total Stats will never be able to be reset. I do like this theme , very clean and stylish interface and great visibility. Awesome Theme and support. Its Simple and Clean. Thanks for the great work. It's my own theme, so of course I am biased, but it's really great. Nice, clean design, easy to read, and all the functionality I could ever need. If you have suggestions or problems, let me know and I'll get them fixed ASAP. Just added Replay mode support! Nice and clean , one of my favs. Hey.. sorry to hear you're having trouble. Were there any particular actions that froze the device or was it random? I haven't heard this before so if it's a problem with the theme I'd like to get it worked out. Perfect theme (blue 1 Watt incrememnts), great job! Simple, easy to read, replay works great, luv it! Thanks! Glad you're enjoying it. Be sure to post in the comments if you have any problems or suggestions. Damn, looks like you were holding back all this time ! I'm new to the DNA scene,due to not being much of a Temp Control fan over my 4 year vape journey.. But I got the GTRS VBOY 200 with the YiHi sx500 on pre release last october and ever since - got into Temp control,and then had to get a DNA, knowing how good a board they make.. So I got a Hcigar 75D,due to dual battery and 75c board and it's great small form factor. Anyway enough of me, I'm here to say how much I'm enjoying your theme and to thank you! As being a new to the theme scene - I can only go by what others I've tried and how I found it to use etc = very easy to find my way around it and it gave me a simple yet well detailed info on everything I wanted to know! I look forward to following your thread and getting into this amazing community .. A really well made and looking theme. Thank you for the kind words! I'm so glad people like it. In the beginning I just built it for myself because there was nothing simple out there (well simple but powerful at the same time). It's great so many other people seem to agree! Please let me know in the comments if you have any suggestions or bugs or anything, I'm always making updates! We've got a bunch of new colors now if you haven't seen the latest version.